Through existing works and new commissions, artists Susan O’Malley, Leah Rosenberg, and Christine Wong Yap explored the question: How do we cultivate happiness? Wong Yap's series of text-based works sewn from ribbons and installed directly on the gallery wall depicted messages encouraging positive mental habits, while a large-scale drawing diagrammed the interconnections between theories of subjective well-being. Rosenberg explored how color, light and material impact our sense of contentment. Inspired by the use of light as a therapy for SAD (Seasonal Affective Disorder), she invited gallery visitors to stand in front of her Illuminated Stripe Works, a series of small striped light boxes, and alleviate negative emotion. O’Malley created a space in the gallery and invited visitors to experiment with various happiness-inducing activities, testing out the benefits of talking and listening to one another, and allowing time to relax. Happiness is… extended outside the gallery onto Montalvo’s 175-acre grounds, with Wong Yap’s Irrational Exuberance Flags. Activating a flagpole in front of the Lucas Artists Program, this rotating series of colorful flags selected by gallery visitors represented the energetic spirit of exuberance and optimism. 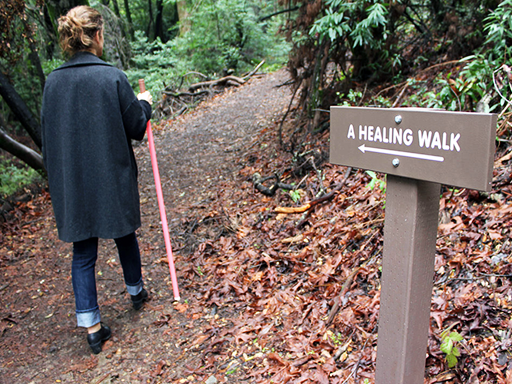 O’Malley created an installation in Montalvo's forest titled, A Healing Walk with signage featuring positive and happiness-affirming directives. Rosenberg provided colorful walking sticks visitors could check out of the gallery to take with them on their walk. Susan O’Malley (1976-2015) was an artist and curator from the San Francisco Bay Area. From posters to pep talks, billboards to vending machines, her art uses simple and recognizable tools of engagement to connect people to one another. O’Malley’s artwork has been exhibited in public projects across the United States—including the Montalvo Art Center, Kala Art Institute, and Palo Alto Art Center in California; the Contemporary Art Museum in Houston; and the Parthenon Museum in Nashville—as well as in galleries and museums in the United Kingdom, Denmark, and Poland. Her installation Finding Your Center was featured at San Francisco’s Yerba Buena Center for the Arts, and her project A Healing Walk is permanently installed at Montalvo Arts Center. Learn more about Susan O'Malley at susanomalley.org. Leah Rosenberg was born in Ann Arbor, Michigan in 1979. She studied at New York Studio Program, Independent Studio, ACAID, New York, New York; received her BFA from the Emily Carr Institute of Art and Design, Vancouver, British Columbia in 2003; and obtained her MFA at the California College of Art, San Francisco, California in 2008. She currently resides and works in San Francisco, California. Spanning painting, sculpture, installation and pastry, Leah Rosenberg’s work explores how color, form, flavor and arrangements affect human emotion. Using a process of accrual and layers, Rosenberg’s works personify how our experiences and memories accumulate, creating a piece with a vivid variety of color and texture. Learn more about Leah Rosenberg at leahrosenberg.com. Christine Wong Yap is an interdisciplinary artist working in installations, sculptures, multiples, and works on paper to explore optimism and pessimism. Her work examines the paradox that mundane materials or situations can give rise to irrational expectations, emotions, and experiences. Major touchstones are language, light and dark, and psychology. Her work has been exhibited extensively in the San Francisco Bay Area, as well as in New York, Los Angeles, Manila, Osaka, London, Newcastle, and Manchester (U.K). Born in California, Yap holds a BFA and MFA from the California College of the Arts. A longtime resident of Oakland, CA, she relocated to New York, NY in 2010. Learn more about Christine Wong Yap at christinewongyap.com. Listen to a podcast of The Aphorists, featuring a conversation w​ith the three artists from Happiness Is... about Positive Psychology, skepticism, cake eating, and creating work that makes a difference. On Friday, January 25, Montalvo Arts Center will inaugurate its new 20-month-long programming theme Flourish: Artists Explore Wellbeing with an exhibition entitled Happiness Is… which will run through April 14. Installed in the Project Space Gallery and also making use of Montalvo’s 175-acre grounds, the show is organized by the Lucas Artists Residency Program (LAP). Participating artists Susan O’Malley, Leah Rosenberg, and Christine Wong Yap address an age-old question: How do we foster happiness and build a contented life? Christine Wong Yap's work was featured on Oprah.com's Inspiration section, with the instruction to "Challenge yourself and change your perspective with these creative pieces of advice." If, after you view the slideshow on Oprah.com, you want to see more examples of the artist's work, you can also check out Yap's website. Claire Fitzsimmons talks with artist Christine Wong Yap on the subject of positive psychology, how optimism (and pessimism in turn) have become a framework for her artistic practice, and the current exhibition Happiness Is… at Montalvo Arts Center. Happiness Is. . . , the title of the three-person exhibition at the idyllic Villa Montalvo's Project Space Gallery, makes knowing use of its ellipsis. Much like the art on display, the unfinished title phrase is an active invitation to complete a thought, a barometer of disposition. The title underscores how happiness is something recognized rather than created and isn’t necessarily easy to come by.